Antioxidants help reduce and neutralise the free radicals in our bodies, caused by harmful exposure to carcinogens in everyday life. Olive products have high levels of polyphenols, vitamin E and oleuropein, which are natural antioxidants. These have been shown to have a host of beneficial effects from healing sunburn to lowering cholesterol, blood pressure, and risk of coronary disease. The antioxidising properties of the olive can be transferred to human cells, to improve longevity and slow skin aging. The olive leaf contains relatively higher concentrations of these powerful antioxidants. Carob comes from the pod of a tree that grows along the Mediterranean Sea. In Greece it is common to see carob trees in Crete and Cyprus. The pod contains a sweet, edible pulp. Once dried and roasted, the pulp is ground into a powder called carob flour (but more commonly referred to as "carob powder"). It's similar to cocoa powder in colour and can be substituted one-for-one in recipes, but carob is unique with its own special flavour and texture. Carob powder has a number of advantages over Cocoa powder and as such is often used to make what has come to be known as 'healthy chocolate'. Apart from the health benefits obtained by substituting Carob for Cocoa and synthetic sweeteners in our diet, Carob also has excellent nutritional value. Along with up to 80% protein, it contains Magnesium, Calcium, Iron, Phosphorus, Potassium and vitamins A, B, B2, B3, and D.
Chlorophyll is the pigment that gives all plants a green colour. It is the means by which plants can convert sunlight into sugars. Chlorophyll is one of the main pigments in olive oil. The colour of olive oil is dependant on specific pigments in the fruit. Green unripe olives give green oil, because of the high chlorophyll content. The chlorophyll content decreases as the olives mature. Early harvest green olives produce greener oil with a "grassy" flavour. Chlorophyll it is an anti-aging substance that helps treat skin conditions and promotes the healing of wounds. Cold does not define any precise temperature. European regulation requires that the extraction temperature be below 27°C in order for the oil to be named “extra virgin”. Unscrupulous producers will use high extraction temperatures and large volumes of added water to maximise yield. Excessive heat vaporises all the antioxidants and polyphenols that give taste and character to the olive oil, rendering it with no health benefits. Lower extraction temperatures result in higher quality oil with higher nutrient levels, but this is at the expense of yield. Due to our extremely low extraction temperatures, our oils are only available in limited quantities. The olive is totally inedible when picked and eaten directly from the tree. Believe us we’ve tried it and they are an acquired taste!. The main skill of olive preparation is in removing this bitterness, to make the olive more pleasing to the palate. We don’t slit or crack the olives or use any mechanical or chemical means to speed up the curing process. In this way the olives retain their beautiful shape and flavour. Most commercial olives are cured with caustic soda, which removes the bitterness within 6 days. Our olives are produced with fresh water curing and left to naturally ferment. This is a slow and labour intensive process, which ranges from 6 - 9 months. Next the olives are placed in organic extra-virgin olive oil, organic vinegar and mixed wild herbs. Unlike most unsaturated plant oils that come from seeds, monounsaturated olive oil is obtained from the pulp or mesocarp of the fruit. Extra virgin olive oil is derived from the first pressing of the olive fruit. Extra virgin olive oil has a delightful flavour, is full of antioxidant properties and can be used in cooking, especially eaten raw. Chemically, the difference between extra virgin olive oil and virgin olive oil involves the amount of free oleic acid, a marker for overall acidity. This is acid that does not form part of a chemical compound but exists on its own natural state. Acidity is a measure of quality and freshness and increases as the oil ages. According to the standards adopted by the International Olive Oil Council, "virgin" can contain up to 2% free oleic acid, while "extra virgin" can contain up to 0.8% of free oleic acid. Our oils’ acidity levels for the 2014 Harvest ranged from 0.13%-0.30% Hippocrates, the father of medicine in the 5th century BC., prescribed medications containing the oil and leaves of the olive tree. He prescribed olive oil for external use and for drinking as a cure for a number of ailments, including inflammation of the gums, invigorate the muscles, and soothe the skin, insomnia, nausea, as a remedy for exhaustion, ulcers, and cholera. He lists in total more than 60 pharmaceutical uses for olive oil. Fatty acids are the building blocks of oil. They are a valuable energy source and are required for a balanced diet. Fatty acids promote healthy, youthful skin and hair. Certain ‘essential’ fatty acids have a protective effect on the cardiovascular system. Essential fatty acids are fatty acids that cannot be constructed within our bodies and therefore must be obtained from the diet. The fatty acid composition of olive oil varies widely depending on the variety, maturity of the fruit, altitude, climate, and several other factors. Olive oil contains more oleic acid and less linoleic acid than other vegetable oils, that is, more monounsaturated than polyunsaturated fatty acids. This renders olive oil more resistant to oxidation and is more stable and resistant compared to other vegetable oils. Monounsaturated fats, such as oleic acid, prevent from the risk of coronary heart disease. Olive oil contains essential fatty acids such as Omega-3 and Omega-6 only when it is cold pressed and unrefined. Commercial oils are inevitably refined, processed and stored, which means that the essential fatty acid content will be partly degraded. Other dietary sources of essential fatty acids are nuts, seeds, fatty fish and unrefined whole grains. Fennel seed (Foeniculum vulgare) is known to be an excellent digestive. It is good for colic in babies, and stomach cramps of all ages. It normalises appetite so therefore can support weight loss. It can treat flatulence, aids recovery from gout and is a cleanser of the liver, helpful for gentle detoxifying. It increases the flow of urine, is a natural diuretic and kidney tonic. Since the days of Hippocrates, fennel seed, or the fruit has been used not only as a tasty culinary herb but also to help ease flatulence, colic and indigestion, to help increase breast milk, as an anti-spasmodic, anti-inflammatory and to help dissolve mucous in the upper respiratory tract in child. The olive is totally inedible when picked and eaten directly from the tree. Believe us we’ve tried it and they are an acquired taste!. The main skill of olive preparation is in removing this bitterness, to make the olive more pleasing to the palate. We don’t slit or crack the olives or use any mechanical or chemical means (caustic soda) to speed up the curing process. In this way the olives retain their beautiful shape and flavour. 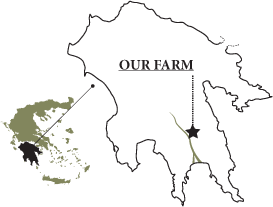 Our olives are produced with fresh water curing and left to naturally ferment. This is a slow and labour intensive process, which ranges from 6-9 months. Next the olives are placed in organic extra-virgin olive oil, organic vinegar and mixed wild herbs. There are several methods of harvesting the olives. Whatever the method, the olives have to be kept undamaged and transported to the press as soon as possible for immediate pressing. The process of picking damages the olives and their skin may be broken or bruised while handling. This affects the taste and the quality of the final product. Manual harvesting is time consuming and labour intensive, but more gentle to the tree, its fruit and its surroundings. Mechanical picking is widely used in mass produced oils. This involves harvesting machines, that vacuum the olives or shakers that shake the trunk of the tree and other branches. This is not very respectable for the tree or the olives but it is inevitable in large mechanised plantations. We have always used hand harvesting to pick our olives because we love and respect the trees and we want to ensure their health for the future. Our olives are transported to the press within a few hours after picking. Oleic acid is one of the main monounsaturated fats contained in the olive. Oils extracted at lower temperatures have higher levels of this monounsaturated fat. Studies show that oleic acid may help lower blood pressure, reducing your risk for cardiovascular disease. Oleuropein is a natural compound unique to the olive tree, found in the olive fruit (especially the unripe fruit) and the leaves. It has powerful antioxidant activity and gives extra virgin olive oil and olives their bitter, pungent taste. Oleuropein has been claimed to strengthen the immune system and protect the cardiovascular system. Olive leaves and flowers (of the olive tree Olea europaea) contain a range of very powerful antioxidants with free radical scavenging properties. The active compounds have been shown to have anti-viral, anti-bacterial and anti-fungal properties. They also have mild astringent properties and have been used traditionally to help relieve fevers, colds flu, and yeast infections. Olive leaf is also good for the heart and has been shown to reduce cholesterol and high blood pressure. Its immune stimulating effects are believed to come from Oleuropein. This well-known aromatic herb grows wild in the mountains and rocky areas all over Greece. The flowers are collected, dried, rubbed and sieved into tiny particles. Oregano is an indispensable herb in Greek cooking. It adds flavour to a Greek salad. It is usually added to the lemon-olive oil sauce that accompanies many fish or meat barbecues and some casseroles. Oregano (Origanum vulgare) is prized not only for its strong flavour and pleasant aroma, but also for its health benefits. Oregano has antibacterial properties and also potent antioxidant activity. It is a very good source of iron, dietary fiber, calcium, vitamin C, vitamin A and omega-3 fatty acids. This evaluates the sensory properties of the oil on the basis of taste, colour and smell. We have chosen to pack our products in metal cans in order to protect them from light. Light exposure is the principal cause of oil oxidation, rapidly progressing to rancidity. After only two months storage in a clear glass container exposed to light, the oil will become oxidised, and loose both its taste and nutritional qualities. Metal containers have the advantage of being better suited for transport, as they are lighter and more resilient than glass containers. What’s more, metal is a more easily recyclable material. The flavenoid polyphenols in olive oil are natural anti-oxidants which have been shown to have antimicrobial action, have significant anti-inflammatory properties, reduce cholesterols, and improve platelet and cellular function. They have a host of beneficial effects from healing sunburn to lowering cholesterol, blood pressure, and risk of coronary disease. The Koroneiki olive variety has inherently very high levels of polyphenols in comparison with other olive varieties. In addition, oil made from green (unripe) olives has more polyphenols than oil made from ripe olives. The polyphenol concentration increases with fruit growth until the olives begin to turn purple and then begins to decrease. Purslane (Portulaca oleracea, Gr. glistrida, antrakla) is a wonderful plant with fleshly leaves, growing wild all over Greece. Although considered a weed by many, in Greece it is widely used as a vegetable or salad, especially in Crete. It is no coincidence that the Cretans have the healthiest population in the world; that is because of the high consumption of olive oil and purslane in their diet! Purslane contains more Omega-3 fatty acids (alpha-linolenic acid) than any other leafy vegetable plant. These protect us against cardiovascular disease and other chronic illnesses such as cancer and diabetes. Actually the special fatty acid-balancing Omega-3s in purslane are actually able to make any kind of food healthier! Purslane is also very rich in dietary fibre, an excellent source of vitamins A and C and minerals such as iron, magnesium, calcium and potassium. Read more here about the secret of Cretan diet. Saffron is one of the most highly prized spices. Greek saffron is distinguished for its excellent quality. The saffron we use in our olive oils is a type of wild mountain saffron which is indigenous to the Taygetus and Parnonas mountains. Saffron has been well regarded since ancient times for its vibrant colour, distinct flavour and medicinal properties. Many of these medicinal properties are due to its high levels of antioxidants which help to neutralise the free radicals in our bodies. Saffron as well as being a potent antioxidant is also known to help digestion and menstrual problems. It is anti-inflammatory and aids memory. Each variety of olive has different characteristics. Some are smooth, some peppery or fruity, lighter or more intense. Oils produced from a single variety give the full flavour of the particular olive tree and the characteristics associated with its geographical climatic and soil conditions. For example a tree grown at 350m altitude in a fertile soil has totally different character from a tree grown near the sea in a sandy soil. Mountain oil has superior organoleptic properties. Most oils available today are blends from different varieties and locations. This does not necessarily mean these oils are of poor quality. However, blended oils do not enable one to capture the unique qualities of a single variety of olive grown on Single Estate, just like in the case of blended Scotches versus Single Malts. The smoke point of an oil, is the temperature at which the oil breaks down. This is the point where flavour and nutritional properties begin to be lost. Olive oil is wonderful for cooking and will not lose its properties when heated. Olive oil is very resistant with a high smoke point of 210oC, and will not degrade as quickly as other oils with repeated heating. Oils that do not have this quality of olive oil become hydrogenated or saturated on heating, loosing their nutritional benefits and actually becoming harmful to the body. In Greece olive oil is used for all types of cooking from frying, cooking, grilling and baking. Butter is very rarely used in Greek cuisine. St. John’ Wort (Hypericum perforatum) is a wild flower and has been considered a medicinal herb for thousands of years. The name of the plant comes from the time of harvesting the flowers in full bloom. This is usually around June the 24th, St. John’s day. The genus name Hypericum is derived from the Greek hyper (above) and eikon (picture), in reference to the traditional use of the plant to ward off evil, by hanging flowers over religious icons in the house during St John's day. Although St. John’s wort is known for its anti-depressant effect , when used externally it has potent anti-inflammatory and anti-microbial properties. Traditionally, St. John's wort oil was used to treat and speed the healing of bruises, burns, sores and wounds. It can also be effective to treat various skin conditions and hemorrhoids. Because of these properties, the oil was used extensively by the ancient Spartans. Dioskurides the ancient Greek physician of the 1st century used St. John’s wort as a diuretic, a wound-healer and treatment for menstrual disorders. The small thyme (Thymus vulgaris) bush grows everywhere in Greece. Its tiny flowers and leaves emit a delightful fragrance, which is linked with Greek cooking and culture. There are many varieties of thyme, which compliment soups, meat, stews and salads. The plant has a long history of being used both as a culinary herb and for its healing properties. Thyme has high anti-microbial properties and primarily used to fight coughs. It is rich in antioxidants and is an excellent source of iron, vitamin K, calcium and dietary fiber. The ancient Greek physicians Hippocrates and Dioskurides, prescribed this fragrant herb for all manner of illnesses. The ancients Greeks burned thyme in their temples as incense offering to their gods. In addition, thyme is an exceptional food for bees. Greek thyme honey is considered one of the best in the world. We don’t use any mechanical or chemical filtering on our products. Factory produced oils are filtered to take out suspended particles and to give it longer shelf life. Our oils are produced solely by natural subsidence filtering and may appear cloudy, with a little sediment. This traditional process gives more body and preserves the different flavours and nutrients of the olives. Most commercial honey and table olives are pasteurised before making it to the market. This means that they are subjected to high temperatures in order to kill bacteria and increase shelf life. This is a process that destroys all the beneficial nutrients. All of our honey and olives are unpasteurised, not processed or heated. They are raw superfoods!